The last time I covered Anheuser-Busch InBev (NYSE: BUD) it had just completed its $107 billion mega acquisition of SABMiller. At the time I commented that whilst it was one of those select few “buy and hold forever” types, there were three major headwinds worth thinking about. These were the future growth prospects, the then current valuation and debt; and though I’m usually not one to measure performance over a simple 12-month period, there might be something in the fact that since the SABMiller deal closed BUD stock has returned -3.7% versus just under 30% for the Dow Jones Industrial Average. First of all let’s start with the growth issue. The short version: it’s going to be extremely hard to come by going forward. Not all that surprising really when you consider the sheer size of the new company which sells $50 billion worth of beer each year. There just isn’t much of runway to work with in terms of tapping new markets or increasing per-capita consumption. In fact there looks to be only four consumer products companies in the world that post higher annual revenue: Nestlé, Unilever, Procter & Gamble and PepsiCo. Historically, the way the big players in the beer industry have faced this low-growth outlook has been through consolidation. In the case of Anheuser-Busch InBev it made huge strides in making the merger/acquisition target as profitable as the parent by exploiting synergies and ruthlessly cutting costs. As a result profits per unit of beer sold go through the roof. 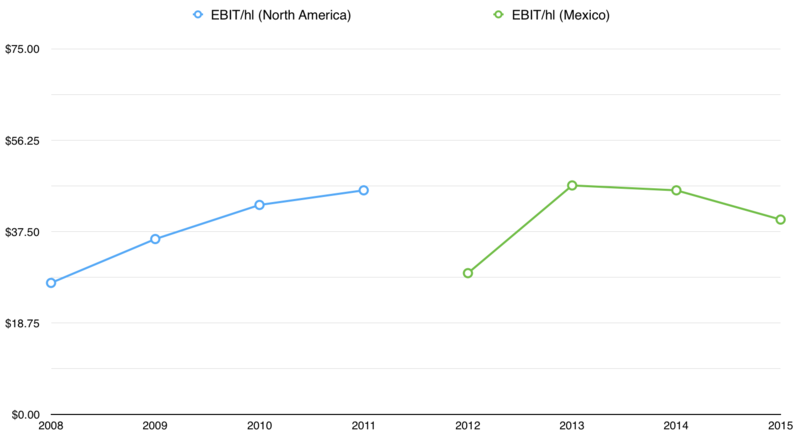 For instance when it took over Mexican brewer Grupo Modelo back in 2013 profit margins in the country doubled. Similarly, after InBev merged with Anheuser-Busch back in 2008 the company grew North American earnings before interest and taxes (EBIT) from $3.77 billion to $5.71 billion. It achieved that within three years even though revenue was static and total volume sold fell from 140 million hectoliters to 125 million. Going forward it’s going to be much more difficult for the company to move the needle in this respect. First of all there just aren’t all that many big acquisitions left to be made given that the company’s global market share is already at something like 20%. Also the SABMiller deal perhaps shows the limitations of the cost reduction strategy since its profit margins were already very high to begin with. For Anheuser-Busch to add another 10-15% in profits via an acquisition it would need to find a brewer already raking in $1-1.5 billion per year in net profit. Unsurprisingly there aren’t that many around, leading many to speculate that the company’s next deal will fall outside of the beer industry. Secondly, I’d worry about how/if the company’s cost control will affect the strength of its brands. For instance when Kraft bought out Cadbury back in 2010 it had to pay a fairly large and well publicized premium for the privilege. Now you could argue that on a long enough timeframe a rich premium will pay for itself many times over given the nature of the underlying business (defensive, high quality profits). However in the modern world timeframes are far less forgiving and shareholders demand short-term results right off the bat. In response Mondelez, the confectionary and snacks arm of Kraft which was spun off in 2012, got down to business with its cost-cutting strategy. Some of it was easy stuff which probably wouldn’t reveal itself (too much) to the consumer; for example moving a factory from the United Kingdom to Poland. Other initiatives on the hand, such as swapping more expensive ingredients for cheaper ones, definitely have reached the consumer. As for how things play out with Anheuser-Busch, keep an eye on market share and volume data. Over the three months to October 2017 total volumes declined 1.2%. In the United States market share was down 0.8% over both the same period last year and over the first nine months of 2017. That’s on top of the 0.5% market share decline the company reported in the US during fiscal year 2016. The second big headwind is the debt load. All of this big M&A activity over the years has left the company sitting on a pretty highly leveraged balance sheet. As the end of 2016 the total debt pile stood at around $120 billion. Net out the $8.5 billion or so that Anheuser-Busch held in cash and equivalents and we’re talking about net debt of circa $110 billion. Even after factoring in estimated 2018 earnings before interest, taxes, depreciation and amortization (EBITDA) of around $25 billion that looks like an uncomfortably large number. Management’s long-term target is to reduce that net debt ratio to something like 2x EBITDA. Once you strip out interest, taxes, capital expenditures and the dividend you aren’t left with a whole lot of cash for debt reduction. 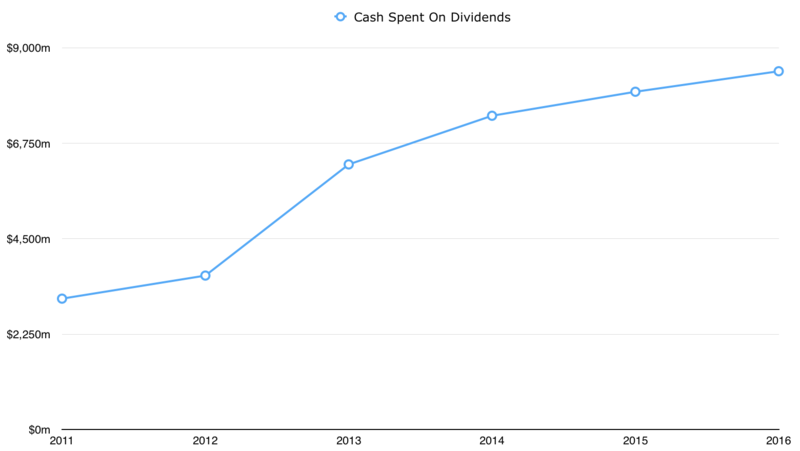 Unless that 2x debt/cashflow target is a very long-term one then don’t be surprised to see a dividend cut in order to get there faster. Given the company currently pays 3.5%-4% interest on that debt mountain then personally I’d see that as a positive development freeing up more cash to reach the bottom line. At the very least we should probably only expect low to mid-single digit dividend per share growth from here on out. By far the most important headwind though is its current valuation. You could forgive low growth out to perpetuity if the stock was going on sale for, let’s say, 14-15x annual earnings. In that case you’re base scenario is already locking in a 6.5-7% shareholder yield. Then you can start thinking about organic growth from purchasing power and volume growth. Since the beer industry is pretty stodgy let’s call that figure as sitting somewhere between 1% and 2%. On top of that you can throw in the high quality cashflow from brands like Budweiser, Corona and Stella Artois which can enrich shareholders in other ways (paying off debt which reduces interest costs, repurchasing shares to increase future earnings and dividend per share growth, and so on). If you tack all that on to your initial 6.5-7% then all of sudden you don’t actually need all that much to hit the magical 10% annual returns mark. That was the great part about buying your well known stodgy consumer companies over the years. Not only did they give you a good starting base (and in some periods even a little bit more), but for long stretches of time you were getting more than just inflation plus a few. A lot more. The issue with Anheuser-Busch stock today is firstly you don’t get to start anywhere near 6.5-7%, instead you’re currently on around 4%, and secondly the “inflation plus a few” outlook is probably as good as it gets from here on out.